Anyone who follows this blog regularly or knows me personally will know that we have a problem with sleep in this house. Big Bear is big sensory seeker and a very restless sleeper. He often wakes in the night to go to the toilet and generally likes to start his day between 4.45am and 5.15am. This is not when J and I like to start our day, and Big Bear gets very tired by lunchtime, so we’ve tried lots of different things to help him sleep for longer – preferably past 6am. The list includes a consistent bedtime routine and red lighting, which is supposed to promote sleep but actually just looked to the neighbours like we were running a brothel. We also try not to talk to him when he wakes up and take him back to his bed in silence if he wakes too early. At one point, in a moment of desperation, we even tried bringing him into our bed – but so far nothing has worked. At Christmas we started him on melatonin – a hormone which naturally promotes sleep – but that’s not really helped either. 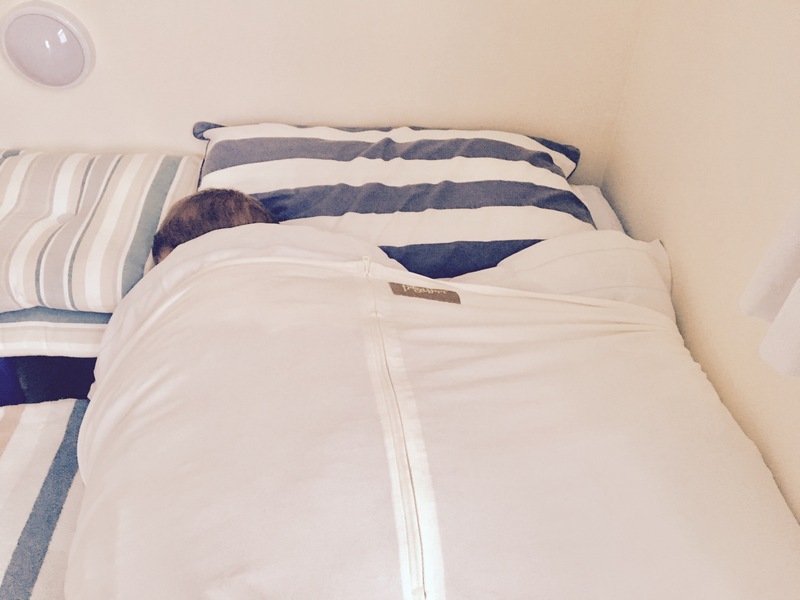 My next plan was to try a weighted blanket but then I heard about Fidgetbum. Fidgetbum is a piece of stretchy cotton fabric which is designed to stretch snuggly around either a single bed or a toddler mattress. It has a chunky zip down the middle so children can easily get in and out. Fidgetbum founder Mel Wood originally came up with the ingenious product as a way of keeping the covers on her daughter’s bed when she moved out of her cot. But now she’s found another niche in the additional needs market. Mel found that the gentle pressure which the fidgetbum brings, can soothe, relax and reassure children. So she’s now exploring a new market for the product for children with additional needs. When she asked if I wanted to try a fidgetbum, I was a bit sceptical. Nothing had worked so far but I’m in desperate need of sleep and I’ll try anything so I said yes. The day after the Fidgetbum arrived we went on holiday to Norfolk. The brilliant thing about the product, which comes in toddler and single bed sizes, is that it packs up small and can travel anywhere with you. Big Bear was sharing a room with J and slept on a mattress on the floor. The fidgetbum fitted very snuggly around the mattress and Big Bear happily slept underneath it. He woke up at about 5.30am and, due to a misunderstanding with the gro clock (we forgot to reset it so the sun came up in the middle of the night), thought it was time to get up. J reckoned that had Big Bear thought it was still night time he would have probably gone back to sleep as he was very snug under the fidgetbum. Either way, it had stopped him from moving around so much in bed, leading to a calmer, more relaxed sleep. We had more success the second night when we’d reset the gro clock. Big Bear slept soundly until AFTER 6am. Truly amazing. We were staying in a holiday cottage with friends for the first three nights and every morning they would tentatively ask what time he’d woken up. Nobody could believe it. It had essentially given us up to an hour extra sleep a night. It made such a difference. For the last three nights we moved down the coast to a chalet. Again, Big Bear slept, waking up at about 6am each morning. The big test came when we returned home. Big Bear’s slept under the fidgetbum for five nights in his own bed now and his average wake-up time has changed to 5.20am. This was at the later end of where we were at before the fidgetbum came into our lives so we can’t complain but it would be nicer to have the extra 40 minutes of uninterrupted sleep. However, we have noticed that the fidgetbum is looser on his mattress than it was on the other beds he slept in. The mattress is just under 15cm deep, which is about the recommended size for the product, but a deeper mattress gives more pressure, something Big Bear obviously needs. We were planning to change his mattress anyway so we’ll make sure we get a deeper one to see if it makes a difference. I’ve got a feeling it will and I’ll let you know. In my opinion this has been a big success. Even on holiday, Big Bear doesn’t change his sleeping habits so to sleep until 6am most mornings was nothing short of a miracle. We’re still using it and may even buy another one for Little Bear. Update: Six months on and the Fidgetbum is still keeping Big Bear snug at night. We changed his mattress to a deeper one, which gives slightly more pressure. His average wake-up time is now about 5.30am. Prices start from £32.99 and go up to £44.99, which is really reasonable for such a fab product in the additional needs market. I was sent a Fidgetbum to trial free of charge in return for my honest opinion.